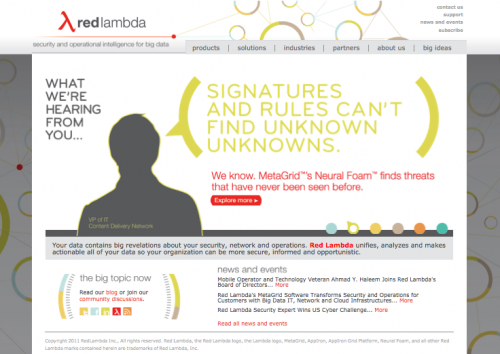 Enter Red Lambda: security and operational intelligence software. Very soon, we will likely be doing some serious brand integration for Red Lambda, who is touted as the foremost provider of security and operational intelligence software for the world’s largest network infrastructures. I think you can expect great things from this up and coming company as security and network operations teams struggle to analyze everything, everywhere, every moment hoping they can quickly detect issues or anomalies. Red Lambda provides some timely solutions, not only by helping detecting operational threats, but also offering capabilities to reveal opportunities to increase operational efficiency and unlock enormous business potential. Watch the video below to learn more.